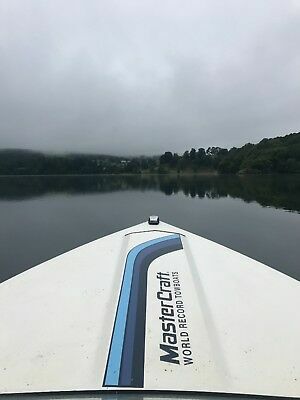 Mastercraft Prostar Tournament/competition waterski boat 1986 world record towboat. Powerful V8 petrol engine that can pull multiple skiers out of the water without a problem. The engine is beautiful, starts first time, every time. Upholstery would benefit from a upgrade if you want it perfect but carpets are like new. It’s not that bad that it’s ever bothered me. I bought the boat to be enjoyed. Reluctant sale but only got used twice last year. Currently garaged at The Low Wood on lake Windermere until the end of March which you can use if you buy the boat. Comes on trailer with brand new winch, light/numberplate board and full fitted cover included. Will be sadly missed, a great boat for very little money. Sensible offers considered. Boat listed elsewhere so reserve the right to remove the listing at any time.